2.4 Where can it be found? Vitamin B5 or pantothenic acid, belongs to the vitamin B complex It is a water-soluble vitamin that was discovered in 1933 in yeast by R. J Williams. The word “panthothen” in Greek means everywhere. The name pantothenic was given to it because this vitamin can be found in virtually all foods and it is very difficult to be deficient, even more so when the body itself is capable of synthesizing it from intestinal bacteria. The word “panthothen” in Greek means everywhere, because pantothenic acid is found in many foods. For energy production and metabolism of fats, proteins and carbohydrates. For the proper maintenance of the nervous system. For the production of important hormones such as adrenaline and insulin. There are no natural deficiencies of this vitamin unless they are produced specifically for research using artificial diets or products that neutralize. 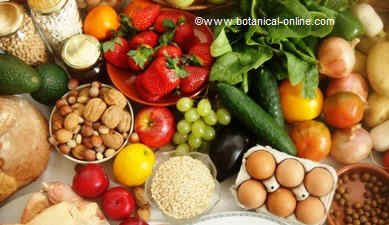 Animal sources of pantothenic acid: All animal foods contain it but it is particularly rich liver or any organ. They are also very rich chicken meat or eggs. Vegetable sources of pantothenic acid: All vegetable sources contain it but are especially rich whole grains (rice, wheat, etc.). Pantothenic acid supplements: Besides food, you can get this vitamin through supplements in the form of capsules or tablets. A varied diet is enough to meet the daily demands of this vitamin. There are however some situations where it may be necessary to increase the daily dose. This vitamin can be taken as supplements (capsules or tablets) with two forms: the pantethine and calcium pantothenate. It improves discoid lupus: The administration of this vitamin may improve the symptoms of this disease that affects the skin. Hair fall? Grey hairs? Maintenance of youth? Abandonment of the alcohol consumption? There are no demonstrated tests on the use of this vitamin to solve these problems. Pantothenic acid has no toxicity, although very high doses can cause diarrhea and fluid retention. Except for therapeutic use, vitamin supplements should not be taken because, in addition to their high prices, they are superfluous, since food provides enough amount of this vitamin.